Every fan of rustic Italian cuisine should have a few simple recipes on hand that reflect the flavors of the country, and a pesto recipe with basil and pine nuts is a good start. Authentic pesto is not only colorful and healthy, it is also one of the easiest sauces to make and can be used in a variety of dishes. There are hundreds of variations on the original pesto recipe. Some versions replace the basil with other fresh herbs, others use different types of nuts or omit them altogether and a few add original ingredients to appeal to personal tastes. However, after all the experimentation, many cooks revert back to the original ingredients when they yearn for that conventional pesto taste. Five basic ingredients and a smattering of salt and pepper are all this recipe requires. Place the basil leaves and pine nuts in the bowl of a food processor fit with a metal blade and pulse a few times to chop. With the machine running, drop the garlic cloves through the food chute and process by pulsing until the ingredients are finely chopped and well mixed. Turn on the food processor, and while it is running, slowly pour the olive oil through the chute in a steady stream. Occasionally turn off the machine and scrape down the sides with a rubber or nylon spatula to make sure all the ingredients are well incorporated. Add the grated cheese all at once and pulse until the sauce is smooth. 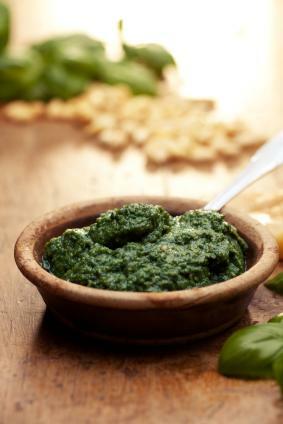 The basic pesto recipe with basil and pine nuts is easy to whip up for cooks who live in areas where fresh basil is readily available year round, pine nuts are a regularly stocked item and chunks of fresh Italian cheese are always for sale in the deli or cheese sections of the supermarket. In regions where only dried basil leaves, processed Parmesan in a can and no pine nuts are available, consider some tasty substitutions. Never use dried basil or processed Parmesan for pesto; the results will be disastrous and inedible. Fresh parsley, especially flat leaf Italian parsley, can be substituted for the basil, as can fresh cilantro or mint. Mixing and matching these fresh herbs produces an excellent pesto with a medley of interesting flavors. If fresh chunks of Parmesan-Reggiano or Romano cheese are not available, look for cartons of these varieties pre-grated or pre-shredded in the deli case. Other aged Italian cheeses like Asiago are also good substitutes. Avoid softer cheeses as they will not blend well with the other components of the recipe. Extra virgin olive oil is preferred for its extremely delicate taste. Any mild oil like canola can be substitute but avoid oils with distinct flavors like corn oil or regular olive oil. Walnuts, especially when lightly toasted, taste quite similar to pine nuts. Other relatively soft nuts like hazelnuts or pecans are acceptable pesto ingredients, although the latter will add more flavor than other varieties. Absolutely nothing can replace fresh garlic in a traditional pesto recipe. Chopped garlic in a jar lacks the necessary bite required for good pesto and garlic powder is not even a consideration. Pesto is not only a snap to make, it also pairs well with many foods. Aside from dressing pasta, this pesto recipe with basil and pine nuts mixed with chunks of cooked red potatoes is a nice twist on conventional potato salad. It also jazzes up baked potatoes, makes a good topping for bruschetta or toast rounds and brightens up simple risotto. Experiment with pesto in various savory dishes and discover the often forgotten joy of simple sauces.